Sorry, there are no shows on sale at Lion & Unicorn Theatre right now. 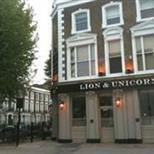 The Lion & Unicorn Theatre is located just minutes away from Kentish Town tube station, in leafy Gaisford Street. This wonderfully intimate black box theatre space above the Lion & Unicorn Pub hosts a variety of exciting productions all year round, including those produced by the venue's own Giant Olive Theatre Company as well as hosting visiting company productions. Under the new direction of Giant Olive, the Lion & Unicorn theatre has quickly developed a reputation for quality, dynamic and innovative productions spanning Classical Works, New Writing, Dance Theatre and supporting new Industry Graduates. The nearest tube station is Kentish Town. The nearest train station is Kentish Town. Bus numbers 46, 134 and 214. There is very limited street parking around the venue so travelling by car is not advised. There is no wheelchair access at the venue. There is no disabled access at the venue.